Okay, so maybe I kinda hated the previous installment of the Transformers franchise. I mean, if you saw it then you totally understand why. But maybe this new film, TRANSFORMERS: AGE OF EXTINCTION, will be better? It really can't get any worse. Right? RIGHT? Bueller? In any case, director Michael Bay clearly has a soft spot for the franchise and continues to revisit the beloved antiheroes of steel in the fourth and latest film, which is said to be "epic." And here's some great news: it's recently been announced that Ken Watanabe and John Goodman have joined the cast as the voices of Autobots Drift and Hound, respectively. They will share the screen (so to speak) with a new live action cast that includes Mark Wahlberg, Stanley Tucci, and Kelsey Grammer. TRANSFORMERS 4: AGE OF EXTINCTION begins after an epic battle left a great city torn, but with the world saved. As humanity picks up the pieces, a shadowy group reveals itself in an attempt to control the direction of history…while an ancient, powerful new menace sets Earth in its crosshairs. With help from a new cast of humans (led by Mark Wahlberg), Optimus Prime and the Autobots rise to meet their most fearsome challenge yet. In an incredible adventure, they are swept up in a war of good and evil, ultimately leading to a climactic battle across the world. One more piece of news that might you like if you're a fan of Imagine Dragons: an original song by the Grammy award-winning band titled "Battle Cry" will be featured in the film. Additionally, the band contributed to the film's score with composer Steve Jablonsky and Hans Zimmer, who assisted in the process. Imagine Dragons will also perform the single at the film's worldwide premiere in Hong Kong, one of the locations in the film, on June 19th. 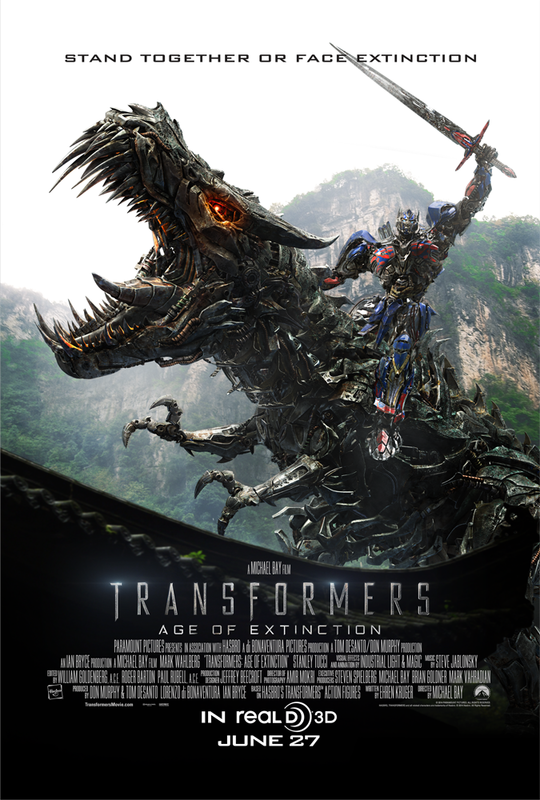 TRANSFORMERS: AGE OF EXTINCTION hits theaters nationwide on June 27th.